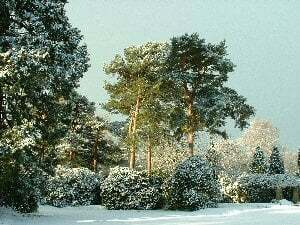 The working week began with Norfolk performing a passing resemblance to a Siberian snow-scape. The weather forecasters had been proved correct and although the snow gave the Kitchen Garden an ethereal, picture-postcard look, it was not conducive to progressing the project. We made a token visit to see if any work could be carried out but with snow still falling and even more scheduled, to be carried in by the raw easterly winds, we had to admit defeat. Even our friend the robin, no doubt glad of the leatherjackets he gorged himself upon recently, did not appear to greet us – he was no doubt tucked up in the bushes laughing at us as usual. However, there were still tasks to attend to under the cover of glass and we decided to sow the Broad Bean seeds, variety Super Aquadulce, into rootrainers and the Compact Plant Trainer. Both these module systems are designed to give a good start in life to deep rooting seedlings and although the generally accepted method of sowing these seeds is directly into a bed, with current circumstances conspiring against us (no beds and heavy snow), we have little choice but to try the modules. As with all the tasks we carry out in this, our first year, we will record how well the beans progress and may well take a similar path with next year’s crop, or not, depending on the results. We will of course report on the progress of the beans, and all the crops we plan to raise, in future updates. The other greenhouse residents all seem to be doing well. The potatoes appear to have the first indications of shoots sprouting and the garlic in the module trays is also progressing well, and will require planting out in the near future, with pots looking the likely destination at present. We will compare the progress of the light and dark potato experiment in our next report although at present the clever money appears to be on the light. With no real improvement in the forecast in the immediate future, pockets of snow still remaining and sub-zero temperatures by night and parts of the day, it appears this placid, mild winter has delivered a late kick. Rest assured as soon as we can see the soil once again, we will be out there in Arctic Norfolk levelling the area and constructing the beds. Please join us as soon as the thaw sets in for further updates as the project moves forward. 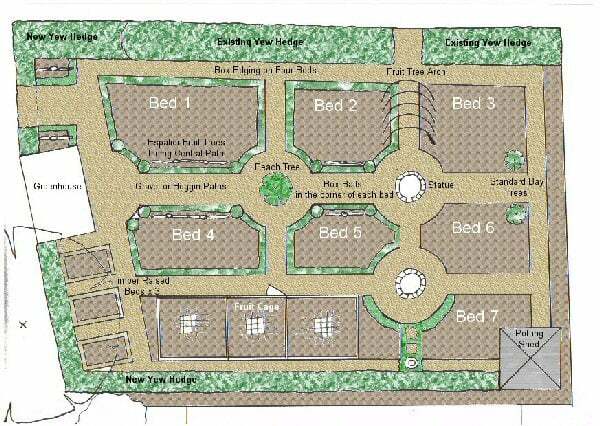 As promised we have produced a copy of the Kitchen Garden Plan below. As always, we are more than grateful to receive any comments on what we have done thus far and what we are trying to achieve -simply contact us.